This is a book I wish I had read a very long time ago. I wish I was reading it over and over again. There are just so many characters involved and I know I missed out on bits…but never fear, I am already starting it over again! This book is just so delightful. I was so angry at some of these people. I adored some of these people. I was totally exasperated with some of these people. With some of them, I was all three things at different points within the novel. When I started this novel, I won’t lie, I thought Dorothea was a bit silly. However, by the end of the book I loved every single thing about her. I wouldn’t change a single thing about her. There are just so many things going on in this novel! 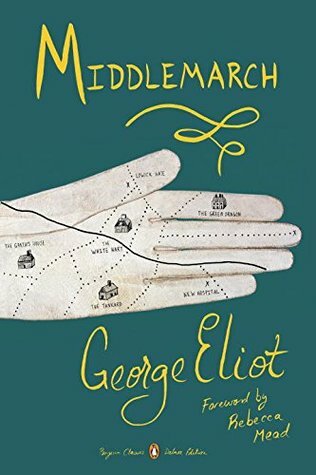 So many little storylines that all make up the day-to-day life in Middlemarch…I feel as if I really MUST do a re-read to make sure I have not neglected or overlooked anyone. I wish I could recommend this book to every single person in the universe. There just aren’t words enough to express how much I enjoyed it. At the same time, it makes me a bit sad because I know most of my friends would ask me what the big deal was and they found it boring. So these feelings just leave me a bit dejected and I don’t even know how to deal with that. So I say now…Go forth and read this book…Love it as much as I do…and if you don’t like it…well….shame on you!!! Uranina, Middlemarch was the first classic I had laid my eyes on in 2016. I was about to abandon it after few pages (I found it bit heavy for someone who had just started with classics), but I’m glad I did not. I won’t say it is my favorite classic; there’re many others I found more fascinating. Also, I found bunch of its pages too descriptive; descriptions that took a toll on me. It nonetheless, as you said too, a must-read for everyone. As it was my first classic read, I’m sure I must have left many things unattended that needed my attention. So will definitely re-read it again, someday. Ohh, what are some of your favourites? I feel a bit silly because I avoided classics for so long and I have loved so many of them that I’ve finally actually tried! Wuthering Heights, Jane Eyre, Anna Karenina, Oliver Twist (not my favorite but I liked it), Pride and Prejudice, A room of one’s own (it’s a non-fiction but I loved it). We all are guilty of avoiding them, aren’t we? They are pleasure but only if we give them time. What are yours? Your favourites.